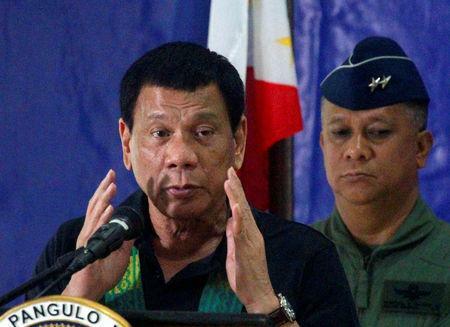 MANILA (Reuters) - The Philippine police have sacked nearly 100 policemen since the start of the year because they were found to be drug users, a top official said on Saturday, in a clean-up of the ranks after President Rodrigo Duterte halted police anti-drug operations. More than 7,700 people have been killed since Duterte unleashed his bloody war on drugs seven months ago, about 2,500 in police operations, while the rest are being investigated. Duterte had been unwavering in defending the police in the face of international outrage over the toll, but his faith was shaken by the killing of a South Korean businessmen late last year by rogue officers. Ninety police officers have been fired since the start of the year and nine were removed last year, Internal Affairs Service Inspector General Alfegar Triambulo said in comments broadcast on ANC TV. "Those caught using illegal drugs, according to the civil service rules, must be dismissed...that is a grave offence," he said, adding that he had promised the chief of police that he would quickly resolve outstanding cases. Triambulo said he would recommend next week the dismissal of 40 more policemen to the chief of police. Last month, Duterte denounced the police as "corrupt to the core" and suspended their role in anti-drug operations, although he vowed to forge ahead with the drug campaign. Human rights groups suspect many of the killings being investigated were committed by vigilantes or hitmen supported by the police. The Philippine Drugs Enforcement Agency has been put in charge of anti-drug operations and Duterte has also raised the possibility of getting the military to help.